Kinloch Rannoch is found 20 miles west of Pitlochry and 20 miles north west of Aberfeldy. It lies in a remarkably remote location at the east end of Loch Rannoch. What makes it remote is that the road through it continues west for just 18 miles to Rannoch Station before terminating on the edge of the vast expanse of Rannoch Moor. The imposing Dunalastair Hotel, while on the north shore of Loch Rannoch to the west of the village is the Loch Rannoch Hotel and Holiday Resort, both offering a wide range of facilities and activities. The South - A9 House of Bruar junction - Road: Head north on A9. One mile north of the House of Bruar junction, turn left toward B847 (signs for Calvine/Struan/B847). Turn right at the junction signposted Tummel Bridge and Kinloch Rannoch. Continue under the railway bridge. After 50 metres, turn right onto an unmarked road. The Struan Inn is 100 metres on the right hand side. The North - A9 at Dalwhinnie - Road: Continue travelling south on the A9 from Dalwhinnie. After approximately 18 miles, turn right at the junction for Calvine toward B847 (signs for Calvine/Struan/B847). Turn right at the junction signposted Tummel Bridge and Kinloch Rannoch. Continue under the railway bridge. After 50 metres, turn right onto an unmarked road. The Struan Inn is 100 metres on the right hand side. Hidden away amid 250 acres of breathtaking Perthshire countryside Loch Rannoch Hotel and Resort is an enduring testament to the charms of highland living, with its comfortable lounges, sumptuous bedrooms and stunning views. The dramatic scenery around Loch Rannoch, plus the endless array of outdoor pursuits which are located nearby, will surely provide fond memories. Marvel at the rugged mountains, enormous lochs, winding rivers and thick woodlands as you drive to local distilleries, castles, craft centres and famous historic sites. Outdoor activities can be arranged nearby or on site relax in our swimming pool which is a short walk from the main hotel, this also has a sauna and Turkish steam bath. So whether you prefer lazy days or sporty ways. You're free to do as you please. Try the elegant Ptarmigan Restaurant for some of the areas most outstanding food and wine. The freshest of local produce (perhaps Tay salmon or Perthshire lamb) is shaped into imaginative dishes by award-winning chefs. Take your time inspecting our wine list on which new and old worlds are both well represented to find the bottle that will match your meal precisely. The Schiehallion Bar offers a less ambitious menu, yet certainly fills and satisfies. Slip into its less formal ambience during the day or the evening. Please note dress code for the Ptarmigan Restaurant is smart casual(no jeans or trainers). By Road: From the A9 just past Pitlochry take the B8019 to Kinloch Rannoch. From the main square take the B846. The hotel and resort should be 1 mile on the right. ByRail: Loch Rannoch Railway Station is approximately 18 miles. Pitlochry Railway Station is approximately 20 miles. Perthshire is situated in the heart of Scotland, and the glorious Tay runs through the centre of it. Rolling hills and bustling towns make Perthshire the ideal holiday destination - there is something for everyone! 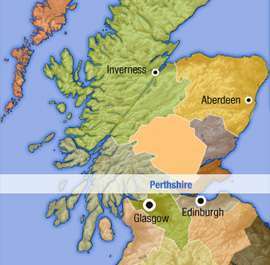 Explore Perthshire and discover the best attractions and outoor activities in Scotland. Book your break in Perthshire today!